With Analytics Edge, your reporting gets a whole lot easier with single-click refreshes, and you don’t lose any of the flexibility that makes Microsoft Excel so popular for Constant Contact analytics reporting. Here’s an example of one engagement that went from idea to “This is AMAZING! !” in 24 hours. 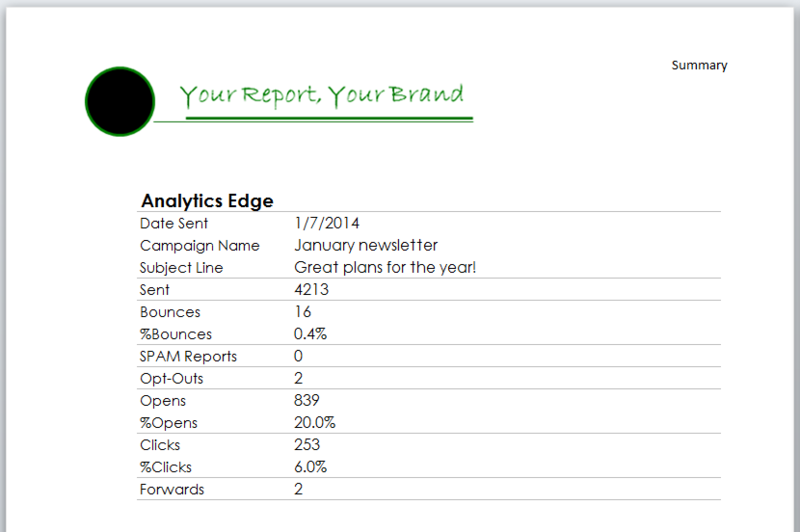 An email marketing solution provider asked if we could modify our free reports for their use. They wanted a simple, branded report that didn’t take a lot of effort to update. They liked the Constant Contact Detail Reports workbook, but wanted a few changes. Most of their work involves sending a carefully crafted message to the client’s subscribers, and then reporting on the results. Since they always report on the most recent message sent, they didn’t need the campaign selection feature of the sample workbook. This was removing steps from the existing report, which had two macros — one to refresh the list and the second to refresh the report. 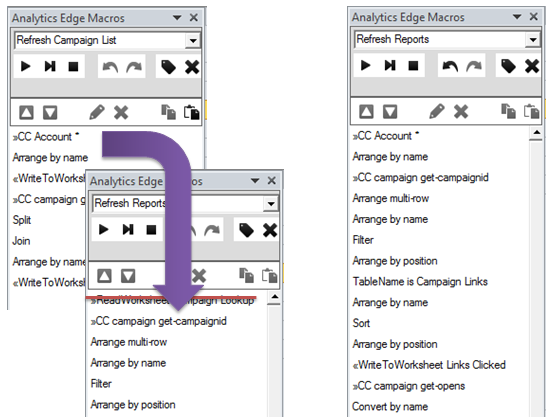 The macros were combined (Analytics Edge lets you copy steps from one macro to another), and the redundant steps removed in a couple of minutes. Next, they wanted their logo displayed across the top of the page, as well as the client’s name and subject line of the message that was sent. 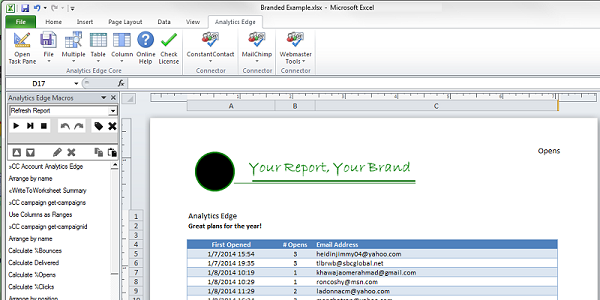 Since the reports are standard Microsoft Excel workbooks, we simply placed a picture of their logo into the page header and adjusted the top margin. 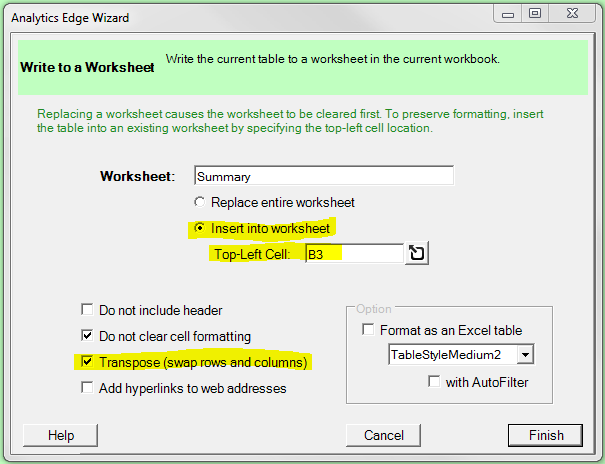 To get the client name and subject line at the top of the form, first we needed to move the existing report’s tables down a couple of rows. 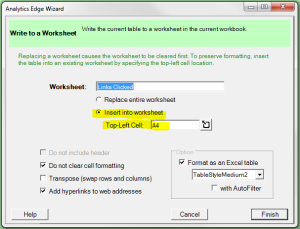 This involved changing the WriteWorksheet macros steps, and selecting the top cell location down a few rows to make room. 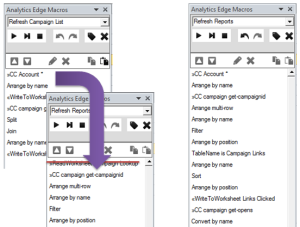 Analytics Edge makes editing quick and easy, using the same wizards to modify existing macro steps as used to create them. No formulas to struggle over! As a final change, they wanted a summary sheet with information similar to the Constant Contact Email Comparison Report, but only for the one campaign, and oriented down the page instead of across. This was accomplished in a few minutes by copying the macro from the other workbook, adapting it to the single email campaign, and finally writing the results transposed in the middle of the worksheet for presentation. The final result, pulled together with very little effort and no programming, was a professional-looking custom report that can be refreshed in seconds with the latest campaign performance results. 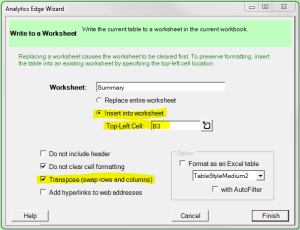 The workbook can be used as a template, making a copy for each client. Since Analytics Edge updates the data without affecting the formatting, you are free to make changes or embellish individual reports with your observations and insight. Analytics Edge is designed to be flexible, adaptable, and easy to use so you can leverage the presentation capabilities of Microsoft Excel without getting bogged down in formulas and manual processes. Custom reports don’t have to be lots of work — Analytics Edge makes the process easy so you can stay focused on your business, not the tool. Download the finished report here. This entry was posted in A. E. Core Add-in, Constant Contact on 2016/01/03 by articles.